Healthy gums are essential, as they provide the support and foundation for your teeth. Healthy gums mean a healthy smile, and also help keep your breath fresh. 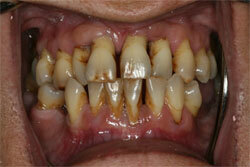 Smoking and the foods we eat and drink can cause staining to our teeth. This stain can be removed, pain free, by using the latest air polishers. The service can be combined with routine cleaning and polishing or can be carried out on request should you want your teeth sparkling for a special event. Gum disease can affect people at any age, and if left untreated it can result in gum infections, make your teeth wobbly and even cause your teeth to fall out. All our patients are tested for gum disease at their initial consultation and during routine check-ups. At the Chris Mercier Dental Practice we offer a full range of gum treatments from simple cleaning and polishing to complex treatments such as full mouth disinfection, surgical cleaning and the latest bone and gum regeneration techniques for advanced periodontal disease. Contact us on 0151 709 7948 today to find out more about gum disease treatment in Liverpool.